Hot Off the Press: STAMPIN’ UP! 2013 COLOR REFRESH! Yes, my friends, it’s true: with the new 2013-2014 catalog, Stampin’ Up! will refresh the four color families! Never fear, there are familiar names here, and Stampin’ Up! will continue to provide outstanding coordination between ink, paper and embellishment. But you want details, I know! With one exception, the “new” colors are familiar – they are In Colors from years past. The exception is what promises to be a delicious new shade of grey called Smoky Slate! I’m personally thrilled with these changes – the colors that are retiring are colors I have seldom used – with the notable exception of Baja Breeze. The In Colors from years past that are becoming permanent include some of my absolute favorites – Pear Pizazz, Soft Sky, and the recent 2011-2013 colors of Calypso Coral, Wisteria Wonder (yay! ), Pool Party (double yay!) and Island Indigo. 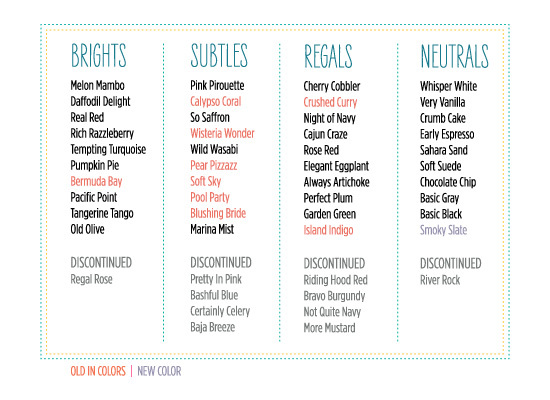 Don’t delay in stocking up on your discontinuing favorites! There’s an added bonus – Stampin’ Up! is offering FREE SHIPPING April 6 through 8!! Free shipping on stamps, paper, ink, embellishments, This ‘n That, My Digital Studio orders – there’s free shipping on it all!! Thank u soooooo much for info. I can stock up with free shipping too.